Issue: Will the Court stay a deportation if the applicant has filed a second (PRRA) pre-removal risk assessment applicant and the enforcement officer has not properly addressed the applicant’s request for a deferral of removal. Issue: Will the Court stop a deportation even if the client can relocate to the European Union? Issue: Will the Court stop a deportation if the applicant’s wife is about to give birth? Issue: Can a stay of removal be obtained when the PRRA officer has not accepted new documents that the applicant has submitted? 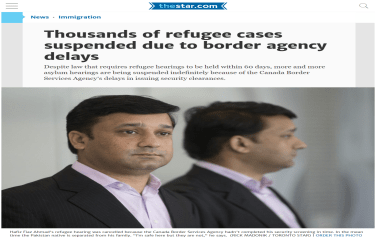 Issue: Can a deportation be stopped even if the PRRA appeal is rejected? Issue: Will the Federal Court stop a deportation even if the PRRA (pre-removal risk assessment) is refused? Issue: Will the court stop a deportation when a refugee claimant is prevented from making a refugee claim? Issue: Will the Court stop a deportation when a refugee claimant is pressured to withdraw her refugee claim? Issue: Will the Federal Court order that a deportation be stopped if the applicants have shown establishment of a successful business? Issue: Will the Court agree to stop a deportation until a decision is made in an underlying appeal? Issue: Will the Court agree to stop a deportation when removal is to the United States? Issue: Under what circumstances will a court stop a deportation?